LORD Sensing MicroStrain has launched a new line of rugged inertial sensors, which the company said will fill a void in the marketplace. Designed for use in demanding environments for dynamic inclination and positioning, the MV5-AR inertial sensors are designed for off-highway and military vehicles; marine and mobile robot applications; and the autonomous vehicle market. 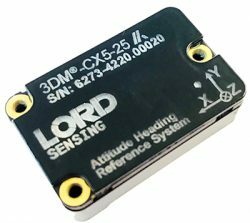 The rugged, compact, state-of-the-art inertial sensors utilize LORD Corporation’s proven fifth-generation high-performance industrial-grade solid-state six-degrees-of-freedom (6-DOF) micro-electromechanical (MEMS) accelerometer and gyro inertial sensor technology. Already successfully deployed on ground robots and heavy-machinery, intended applications include autosteer and terrain compensation; dynamic incline detection (roll, pitch, rotation); vehicle stability and leveling; platform control, alignment and stabilization; operator feedback; and precision navigation. The MV5-AR model has a compact and rugged reinforced PBT housing fully sealed for immersion, pressure wash (IP67, IP69K) as well as a rugged, reliable molded-in AMPSEAL 16 connector. Each sensor is fully calibrated and temperature compensated, the company said. Low-cost, compact size that is among the smallest form factor in its class. Full 360-degree measurement range about all axes; it can be mounted in any orientation. Full accuracy over the entire operational temperature range of -40°C to 85°C. Auto-adaptive extended Kalman filter for optimal dynamic accuracy. 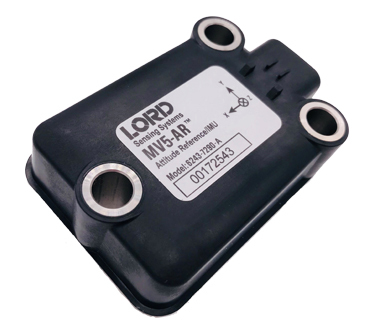 The MV5-AR provides inertial and slope J1939 messages in its standard configuration. Customized CAN protocols and messages are available. Low-cost, compact size and full 360-degree measurement range about all axes. Auto-adaptive extended Kalman filter for optimal dynamic accuracy and on-vehicle performance.